Epoxy coatings are durable coatings that can be used for a variety of purposes from strong adhesives to durable paint and coatings for floors and metals. Epoxy coatings are created through the generation of a chemical reaction using an epoxide resin and a polymine hardener. When these two chemicals are combined, a process called “curing” results. This process can take anywhere from several minutes to several hours and turns the liquid epoxy coating in to an extremely strong and durable solid. Because of its ability to create a strong, durable, and chemically resistant substance, epoxy and epoxy coating compounds can be used for a variety of purposes. You can find epoxy coatings used throughout industrial manufacturing plants, in composite materials such as carbon fiber and fiberglass, and in a variety of electrical, automotive, and marine applications. Epoxy materials and epoxy coating compounds can also be used as durable adhesives in a variety of applications. White Goods Coating Applications: An epoxy coating is often used as the powder coating on washers, driers, and other “white goods” because it is durable and easy to apply. Automotive and Marine Applications: An epoxy coating will act as a primer to prevent corrosion and ensure the adhesion of paints on automobiles and boats. Steel Corrosion Resistant Coatings: Fusion Bonded Epoxy Powder Coatings are used for corrosion protection in steel pipes and fittings used in the oil and gas industry, water transmission pipelines, and concrete reinforcing rebar. Metal Can and Container Coating: Metal cans and containers are often treated with an epoxy coating to prevent rusting especially when used to package acidic foods such as tomatoes. 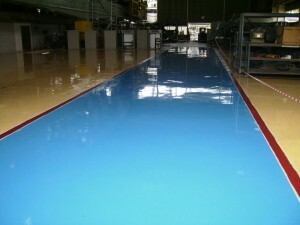 Flooring Applications: Epoxy coatings can be used as epoxy floor paint in industrial or commercial applications. When used in flooring applications, an epoxy coating will result in a durable, long lasting flooring solution. Epoxy coatings are used over concrete floors in a variety of commercial and industrial applications such as in manufacturing plants, commercial and retail stores, industrial plants, warehouses, hospitals, showrooms, garages, airplane hangars, and more. Epoxy coatings and floor paints provide a decorative, high gloss finish that is available in a variety of colors and styles. Decorative options that are available when using an epoxy coating on floors include terrazzo flooring, chip flooring, and colored aggregate flooring. An epoxy floor coating offers an easy to clean and chemically resistant flooring solution, which can be applied directly over new or old concrete floors. At RC Corrocare's Services, we use durable epoxy coating compounds to offer epoxy floor paint application services. If you are interested in learning more about how our epoxy coatings can create a durable and attractive flooring surface for your commercial or industrial facility, please feel free to contact our epoxy floor application company. Using our durable epoxy coatings, which are available in a variety of colors and styles, we can offer a solution to make your flooring more functional and attractive.